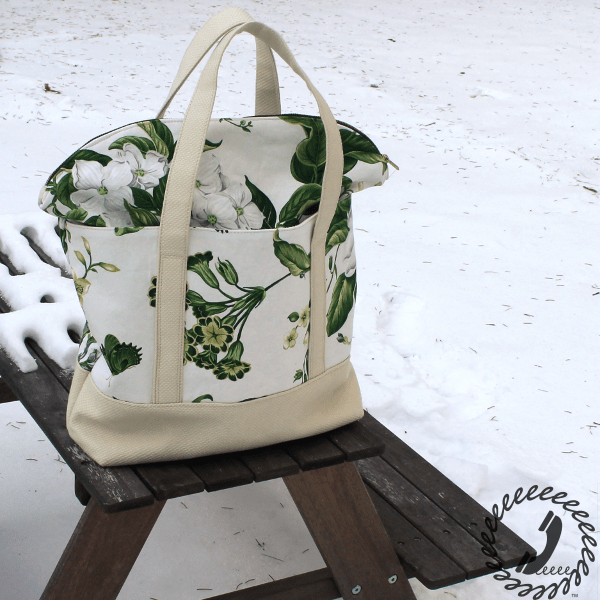 I finally feel like we are settling in after the Holidays and a long trip up north, so I thought I’d quickly share a Senna Tote I made for myself this week. 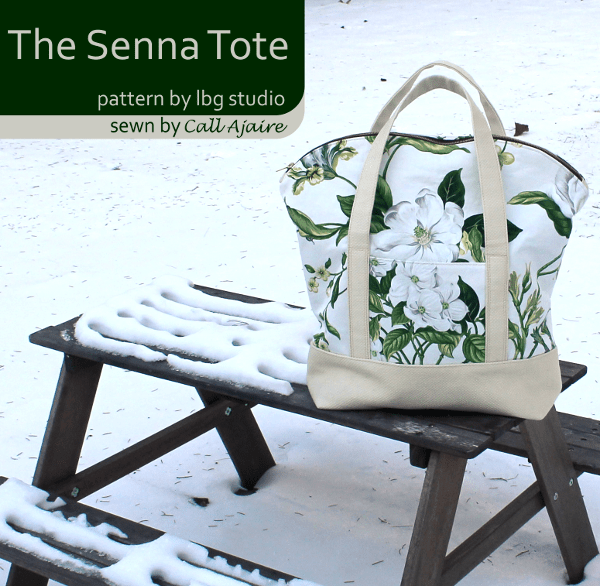 The Senna Tote by LBG Studio is a pattern I’ve been drooling over for ages now. I finally bought it in late 2014 during a sale and couldn’t wait to make one of my own. I really enjoy sewing bags, but for me it’s usually more time consuming than clothing. It’s not that the technical details are tricky or anything, but there are usually more pieces to cut out (out of multiple fabrics AND interfacings) and when it comes down to it, that all just takes time. And if there’s one thing I seem to be short on these days it’s time. This weekend I’m going to New York to visit with good friends and go to their Theater People live podcast which I’m super excited about. It’s just for a night, but this will be the first time in ages that I’ll be traveling alone. I don’t want to bring a bulky suitcase with me on the train, so I decided it was time to finally whip up one of these totes. The pattern goes together relatively quickly. My favorite thing is that there are actual pattern pieces and not just measurements for each piece. I know that some people prefer to just be able to cut everything out with a rotary cutter, and sometimes I would agree, but most of the time I like to be able to lay out the pattern pieces on fabrics from my stash to see what will work or what I will have enough yardage of to use. It’s much easier for me to visualize with pattern pieces than it is with measurements so I was really pleased to find a printable pattern. For the bottom and straps I used a winter white upholstery fabric with a neat waffle texture from my stash. It’s probably inadvisable to use white for the BOTTOM of a bag and it will most likely be filthy immediately, but I just loved how it looked so I went for it. Maybe a nice coat of scotch guard will help? Anyway, the main fabric is a floral drapery fabric that I only had one yard of which has been sitting in my stash begging to become a bag for years now. 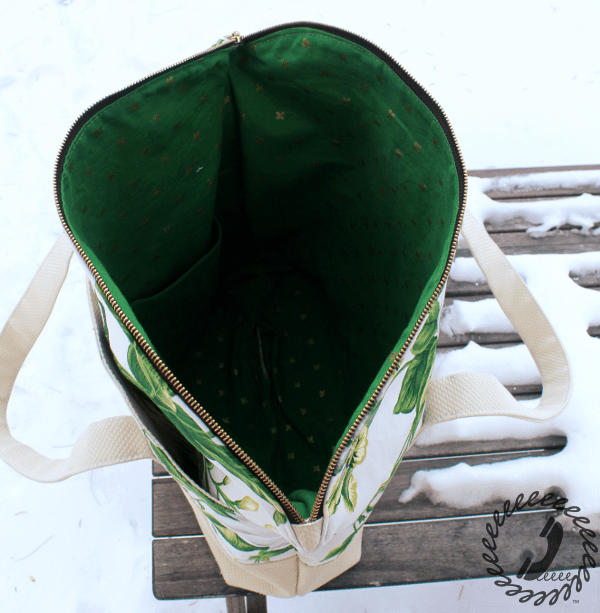 The greens seemed to go well with the cotton + steel fabric I got from Imagine Gnats (*affiliate link) so I used it for the lining and inner pockets. I couldn’t be more happy with how the tote came together. 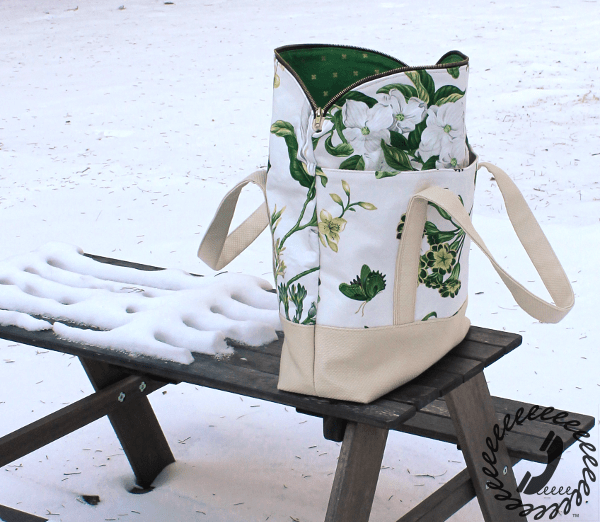 Have you made a Senna Tote yet? I know I’ll make at least one more for myself for sure. I love this bag Ajaire! I too am in love with totes and opening my spare closet will prove that in a hurry. The greens are beautiful. I think scotch guard is a great idea. Have fun in New York. A getaway with friends is always refreshing. I LOVE how "Spring" this bag is!!! It looks very very well made! Thanks Karly! The pattern is so well done that it makes for a really professional looking finish. it would have been perfect for your trip too! Also I planned to do a lot of things before the holidays….so I get it. It's a great looking bag. Enjoy your night away! Nienke, this is the bag for you to try. Seriously. The instructions are so clear and there really aren't that many steps compared to some other bags I've seen. The pattern pieces really help to visualize it as your sewing too. You could totally do this one! Thanks Cindy! I think I'm most excited about the little alone time on the train where I can just listen to my headphones and read haha. No! Just normal interfacing (like what you might fuse to a collar) and then basic canvas (maybe a little lighter-weight than duck cloth) as an interlining. That gives the bag some structure without having to get any specialty items. The other fabrics are entirely up to you! Oh and a 22" zipper and two snaps. I used magnetic snaps so you wouldn't see them on the outside, but you could also use anorak snaps. Let me know if you'd like to know yardages 🙂 Also, I'm not affiliated in any way other than I like Vanessa and LOVE this bag haha. the post is scheduled for February 15. As per my agreement with SMS i do need your express permission to use one of your photos, so if you’d like to be included, please respond ASAP.